The next Gearhead Hybrid Stove is under construction right now (prototype only). We are building a slightly smaller firebox (about 2.6 cubic feet), and version 3.0 of our hybrid combustion design. The Ideal Steel Hybrid (going into production soon) had the lowest high burn emissions on record, and with new regulations coming, there’s an incentive to flatten the emissions curve even more. One of the most important things for us is the combustion design, but we'll do a lot of testing over the summer before “going public” with the internal workings of this stove. This stove will definitely be sideloading (left or right), and have a top and rear vent. We plan to make an inexpensive basic version - a utilitarian workhorse that is easy to use but has some nice details (see Basic Version, at right). Then we think we will make a steel Franklin stove. 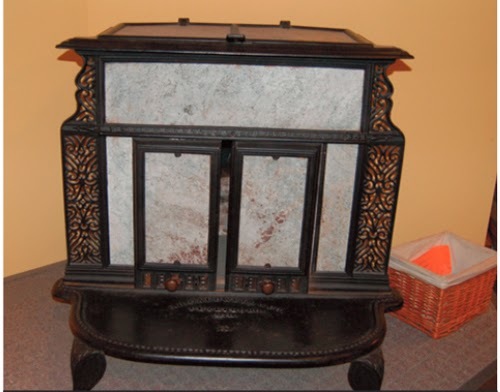 Some of our favorite antique soapstone stoves have Franklin stove designs, and we manufacture three gas stoves with Franklin designs, including our unique 17 inch tall Mini Franklin gas stove. Franklin Stove Design lends itself perfectly to steel fabrication. We plan to alter the shape of the wings, ash lip, and door as well as the stove ornamentation, to reflect different periods: Arts and Crafts, Gothic, Transitional, or Modern for example. The sketches at the right and below are not final by any means, they are just offered to show the general direction we are heading in. 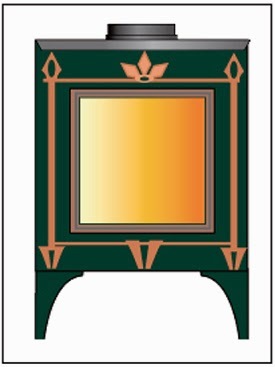 We plan to beta-test this stove extensively next winter, and have it available in June/July of 2015.